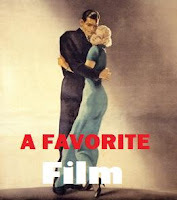 This is a new Tuesday category for me, begun last week: A Favorite Film. Down the road I hope we'll discuss all sorts of Favorite Films. Hopefully, some of them will be favorites of yours as well. If you'd like to treat this as a 'meme' please feel free to use my 'badge' up top and post your own Favorite Films on Tuesdays and we can link up the posts. 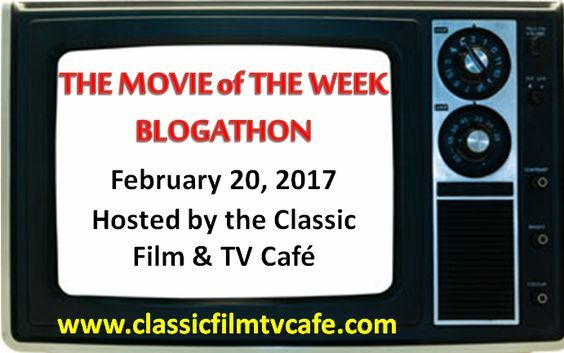 Today's post is actually about TWO favorite films, both named THE PRISONER OF ZENDA. (From the novel by Anthony Hope.) I just couldn't decide which one I liked best, the Stewart Granger (1952) or the Ronald Colman (1937) version. I truly do love them both and can watch them anytime. I recommend seeing both if you get a chance or have the inclination. 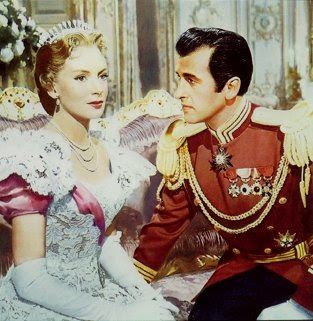 The Granger version is, of course, in glorious Technicolor (the best film color ever in my personal opinion) with Granger and his co-star Deborah Kerr (who was born for Technicolor) showing to their best advantage. 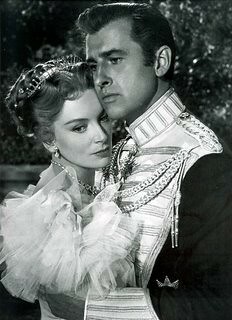 I was always in a swoon over Stewart Granger in these sorts of rolls anyway. I mean, who can forget: KING SOLOMON'S MINES (also with Kerr as co-star) and SCARAMOUCHE (those incredible black and white tights! ), all in blazing color. Sigh...! 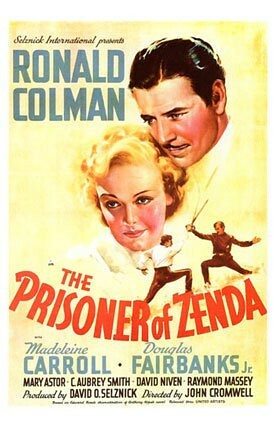 Watch the PRISONER OF ZENDA trailer and see if you don't agree. The IMDB site has this listed as being the Ronald Colman trailer, but it's not. It's the Stewart Granger trailer. Unfortunately, I couldn't find one for the Colman film. But here's a video I found on youtube of the first eleven minutes of the Colman film. 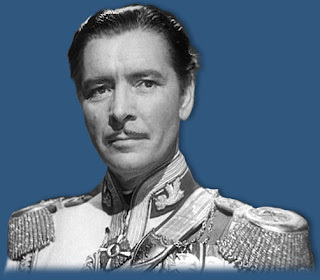 The Ronald Colman version has, of course, his unruffled, startlingly royal looking persona and that voice, that incredible speaking voice unlike any other. It has Madeleine Carroll as his leading lady. (She's all right, I'm not that crazy about her since she behaved so abominably towards Robert Donat in The 39 Steps.) This film also has an amazing cast: David Niven, Douglas Fairbanks, Jr., Raymond Massey, C. Aubrey Smith, Mary Astor - I did say amazing. 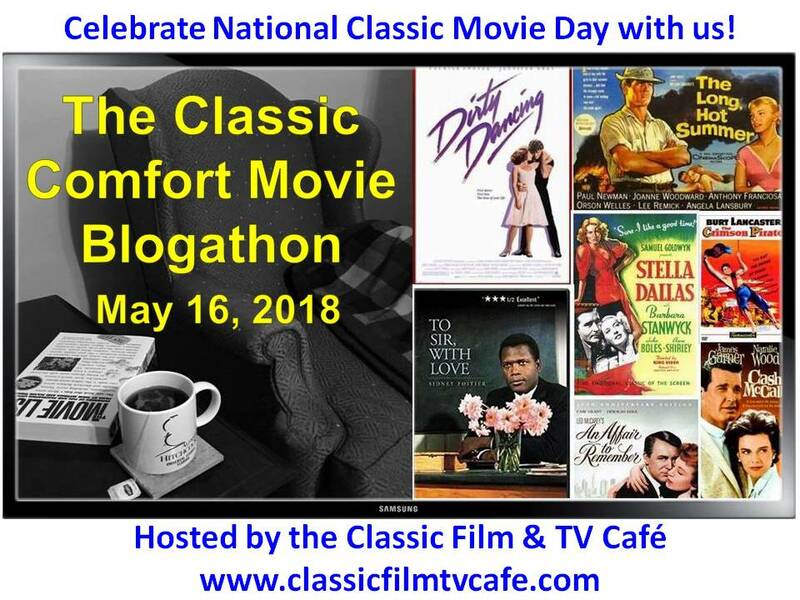 The Stewart Granger version has James Mason, Louis Calhern, Lewis Stone, Jane Greer - not as distinguished a cast as the earlier film, that's for sure. Although they all acquit themselves very well. 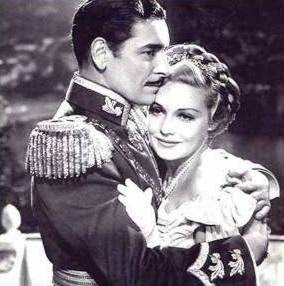 Okay, so in casting, the Ronald Colman film is the winner. Now that I'm thinking even more about both films, I'm picking the Colman version as the all around best one. Though, as I said, I recommend watching both. 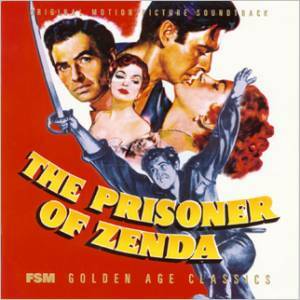 THE PRISONER OF ZENDA is a fabulous, over-the-top tale of love, duty, sacrifice and honor -all the good stuff. (It would make a great opera.) All the things that, perhaps, seem a bit old school in today's world. But once-upon-a-time, men and women actually gave and kept their word, loved with deep devotion and sacrificed for the sake of honor. Here's the story in a nutshell in case you're not familiar with it: The hero, Major Rudolph Rassendyll (That's his name, not much I can do about it.) is on a walking tour of the Principality of Ruritania. There he is mistaken for the King of Ruritania (I like saying the name.) who has disappeared, unknown to the general populace. It turns out he (the king) has been drugged and kidnapped so his brother (if I remember correctly) or first cousin can be installed as king in his place. It also turns out that Rudolph looks EXACTLY like the King who, by the way, is a wastrel and unworthy of the beautiful princess Flavia whom he is to marry. Anyway, you guessed it: Rudolph is hooked into a daring plan. He is asked to impersonate the King at least until the actual King can be found and convinced to behave himself like the monarch he is. Long story short: Rudolph is successful in his impersonation, so successful that the Princess Flavia falls in love with him -he is, after all, in character and deportment, everything the REAL king is not - so one can hardly blame her. Rudolph, of course, falls in love with the princess - an impossible situation. In the meantime, there's a desperate search on for the 'real' king which involves secret plots, lots of derring-do, swash and buckle and fights to the death. The conspirators, you see, KNOW that Rudolph is not the real king, but they can't let on lest they be revealed as KNOWING what has happened to the real king. Great stuff. How all this is resolved is thrilling fun to watch and enjoy. My favorite bit of dialogue comes at the end: One of the king's men who has been helping Rudolph carry out the impersonation, says goodbye with this incredible line and a bow, "Sometimes fate makes the wrong man King." Sigh. I LOVE that line! You must, of course, suspend your disbelief while watching movies of this sort but I've always believed that that was what movies were about anyway: suspending our disbelief and being transported to another time and place. (This is why the older films have such a special spot in my heart.) There's enough ugly reality online and in the newspapers, thank you very much. These are movies that I'm familiar with but have never watched. I've been told countless times how good they are so I really need to get on it. Thanks for the post. I haven't seen the Granger version for years, but my preference is for the original. As you say, what a cast! As usual, Ronnie is divine but Doug Fairbanks Jnr. comes close to stealing the film. 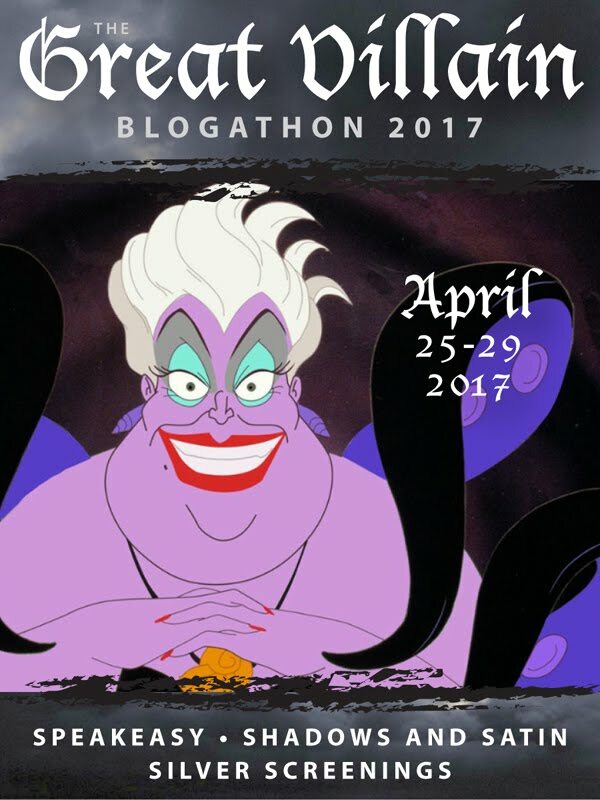 What a devilish rogue! Interesting that you pick out Madeleine Carroll as the weak point in the cast. I agree - but I think that's because she's given quite a limp role. None of the fizz and crackle of her 39 Steps appearance! Incidentally, I find her sulkiness in 39 Steps VERY attractive... Carroll was one of the most glamourous stars of that period, and a good egg in real life too (she gave up her Hollywood career to serve in field hospitals in WW2). Great choice of films, Yvette - looking forward to seeing what you pick next! Nicolas: Thanks for the info on Madeleine Carroll. For me, she ruins 39 STEPS by being so obstinate and calling for help when Robert Donat so obviously is telling the truth....sigh! I enjoy both versions: Ronald is a better actor, but the remake has the glorious color and Deborah Kerr. I find it fascinating that Granger's version features the same script and almost the same shooting angles. It must be one of the exact remakes ever! So glad you mentioned SCARAMOUCHE, one of my very favorite of all swashbuckling films. Have you read book? THE PRISONER OF ZENDA is wonderful in book form too. The only thing about SCARAMOUCHE that seems off is American Janet Leigh as the heroine. Her hair is all wrong almost throughout the whole film. Ha. But I'm being picayune.